Photo and preparation by Bill Snider. I was in seventh grade when I first learned that eggs fried in bacon fat aren’t just delicious, they’re a transcendent revelation. I attended seventh grade at a tiny backcountry school in northeast San Diego County. My class was combined with the eighth grade, and my teacher had us all in one small room all day long. In between science, math, P.E. and social studies, Mr. Seeman mixed in a ton of reading and writing. When I went to high school, I was ahead of the curve, having already read most of the classics. I could also write haiku and diagram the heck out of a sentence. Mr. Seeman was a byproduct of the sixties, and a sort of hippie Renaissance man with an expertise in multiple subjects. After teaching us how to cook garlic chicken, he promised to treat the top students to a camp-out in the desert, complete with a campfire breakfast the next morning. On the menu: eggs fried in bacon fat and toast with boysenberry jam. Game on, I thought. I dreamed about boysenberry jam and studied my brains out, getting hung up on poetry. I didn’t like rhyming poetry one bit until the day Mr. Seeman handed out copies of The Wreck of the Edmund Fitzgerald by Gordon Lightfoot. The prose not only drew me in with its rhythms and beats, but wow, what a story! The next day, he brought in a record player, dropped the needle and played the poem. It turns out that writer Gordon Lightfoot, to my absolute amazement, was a musician! Mind blown. I earned a seat on Mr. Seeman’s VW bus to the desert. He and his wife bunked in the van, and the 12-year-olds slept under the stars, dazzling each other with our new knowledge of the constellations. The next morning, true to his word, he fried eggs in bacon fat, and soon came the moment I’d been waiting for. He opened the door to the little cupboard where the jam had been stashed in the van, and it fell right onto the floor; shards of glass and purple goo flew everywhere. I’d never known such soul-crushing disappointment. And that, my friends, is how a food writer with an unreasonable fondness for folk music is born. These are the stories my husband listens to, and upon hearing them, he satisfies my nostalgic tummy with the perfect meal. The bacon fat makes him think of pork, so he decides a pulled-pork sandwich is in order and slow cooks a pork tri-tip all day in cider vinegar, garlic and brown sugar. He likes his coleslaw on the side, I like mine inside the sandwich. Pork is the quintessential comfort food – indulgent, flavorful and versatile. The smell-memory of sizzling bacon conjures feel-good emotions followed by strong hunger pangs that must be satiated immediately. In Ojai, we have plenty of places to feed your soul and satisfy your pork cravings. 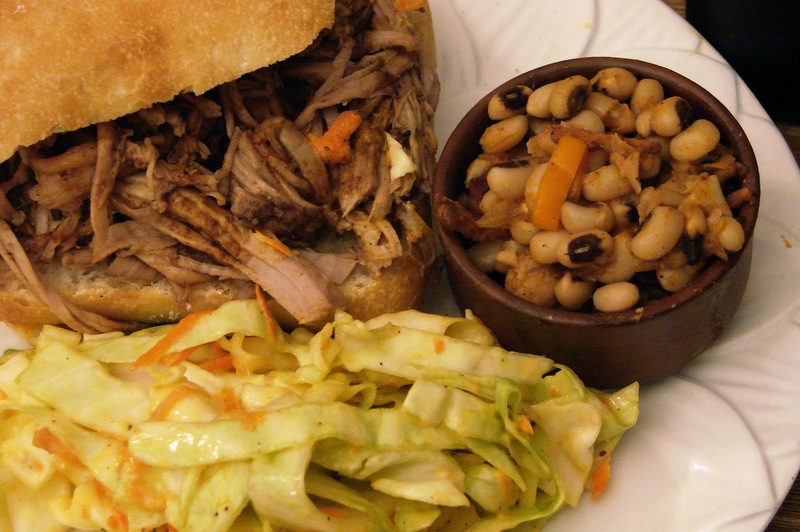 Chef and owner Susan Coulter is sure to give me a fair amount of ribbing about singing the praises of my husband’s pulled pork sandwich, and I’m not trying to curry favor when I say that hers is damn good. It’s no wonder it’s been awarded Best Sandwich by readers of the local paper several years running. Specializing in New American cuisine, Coulter also features a new pork dish every season that makes my mouth water. Typically, it’s slow cooked until succulent and served up with creamy polenta or mashed potatoes, but she’s also been known to prepare it in a bright and spicy green curry with fresh local vegetables. I know, I know, what’s a bakery doing in the pork run down? Though they are best known for their traditional Mexican pan dulce, fruit-filled empanadas and apple fritters the size of a Wham-O Frisbee, this family-run bakery knows pork, specifically, carnitas, which translates to “little meats.” The pork carnitas are fried and served either on tortillas, or, even better, on a torta with their own homemade bread and the traditional accompaniments of diced white onion and cilantro. Also in the pastry case, paying homage to their most popular dish, are crunchy molasses pig-shaped cookies – delicious dunked in milk or coffee. Fairly new on the foodie scene, this gourmet food truck features produce and meat from local farmers and ranchers. The menu includes hand-formed burgers, smoked chicken tacos, coconut grilled chicken burritos and more, all prepared with creativity and sustainability in mind. Pork takes center stage here, though, and no one does pork better than chef and owner Tim Kilcoyne. He usually buys a whole hog from a small local rancher and finds unexpected ways to prepare it. The house-cured porkstrami with caraway mustard slaw and the smoked pork with peanut butter and strawberry jam are game changers. Don’t miss the hand-cut fries with Kilcoyne’s own homemade ketchup. You can usually catch him here in Ojai on Sundays next to the farmers’ market. What I like best about this independent grocery store with a full-service butcher in the back is that they sell single slices of thick-cut bacon. I’ll buy four slices and render the fat so that I can enjoy my bacon now, and later, when I get a hankering, I can use a teaspoon of the fat to fry eggs or sauté green beans with a little olive oil added. An article about pork in Ojai would not be complete without mentioning ethical sources. Rainbow Bridge is an upscale hippie market that carries pork and other meats that are sustainable, vegetarian-fed and humanely-raised and slaughtered with the strictest handling protocols. Not only that, the meat is extraordinarily tender and flavorful. Now, if you’ll excuse me, I’m going to spin some Gordon Lightfoot and take a big bite out of this pulled pork sandwich. For more on Ojai’s food scene, go to www.facebook.com/DishingOjai.